We are so delighted to be presenting with Choices for Youth, and in partnership with Buy Social Canada, a Social Buying for Social Good networking event and symposium. Social Buying for Social Good is a public networking and interactive panel event to celebrate the innovative social enterprises that exist in our community. This event takes place on Thursday, January 19th from 7 to 9 pm at the ALT Hotel St. John’s. 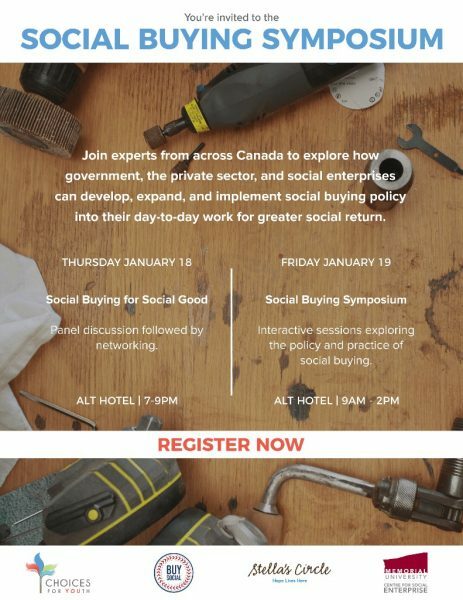 The Social Buying Symposium will connect Canada’s experts in social procurement with Newfoundland and Labradors private and public sector decision-makers to collaboratively explore how to develop business policy and practice for social good. This even takes place on Friday, January 19 from 8:30am to 3:00pm at the ALT Hotel St. John’s.